The Messages app is probably one of the most frequently used apps on your iOS device. It's the most common place to send text and multimedia messages, and it’s also packed with advanced features for managing conversations. We’ll show you how to be an iMessage master so that you can communicate faster and better with your iPhone and iPad. 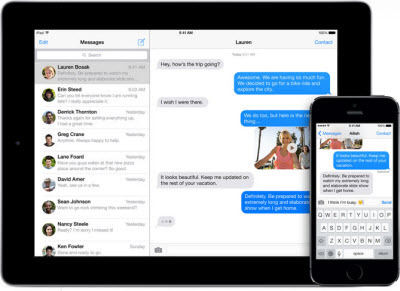 This guide will walk you through the new iMessage and text features on the iPhone and iPad. Check the list of tips that will let you take advantage of all of the features of Messages and iMessage. Group conversations are listed by participants’ names; you can assign a label. Tap Details (top right of conversation), and swipe down to reveal a field above the list of participants, then type a label such as “Reunion.” Swipe right to left on a name to reveal a Delete button; tap this to stop them receiving contributions. Tap Add Contact to add more people to the conversation. When meeting someone, tap Details and look under Location. You can share your current location or share your live location for a period of time — an hour, end of the day, or indefinitely. When you receive a location, tap the map to view it fullscreen. Choose walking or driving directions and tap Start, or tap Apps to find navigation apps that will help get you there. Notifications can become a distraction. Tap Details (top right of the conversation) to turn on Do Not Disturb. This doesn’t turn on Do Not Disturb for everything on your iPhone, as the switch of that name in Control Center does – it mutes only this conversation. You’ll still receive messages so you can catch up later, and at any time you can turn this switch off again. A sender of unwanted messages can be blocked by tapping the “i” next to their name, then Block this Caller. This also prevents FaceTime and phone calls from that person. You can review everyone you’ve blocked under Settings > Messages > Blocked, and unblock them if necessary by tapping Edit, then the red minus button next to their details. Tap and hold the mic button to the right of the field into which you’d type an iMessage. The app will record as soon as — and for as long as — you hold your finger there. When done, slide your finger up onto the arrow to send the soundbite, or slide left to the cross to delete it. To listen to the soundbite, lift your finger then tap the play button that appears where your finger was. Tap and hold the camera icon (left) to take a photo or video using the front-facing camera. Slide your finger onto the camera icon and lift to send a photo; slide to the red button and hold to record a video. When done, slide onto the arrow to send the video. To send a photo or video you’ve already taken, just tap the camera, then choose from the options. The text in SMS, MMS and iMessages doesn’t take up much space, but you may want them deleted after a period of time so you don’t have to manage them. Go to Messages’ settings and tap Keep Messages. Opt to keep messages for 30 days, one year, or forever. Choose either of the first two options, and you’ll have to delete messages that are already older than that right away.